The 58-year-old former businesswoman says she has experience managing change and building operations, and has also sat in opposition in the Commons. 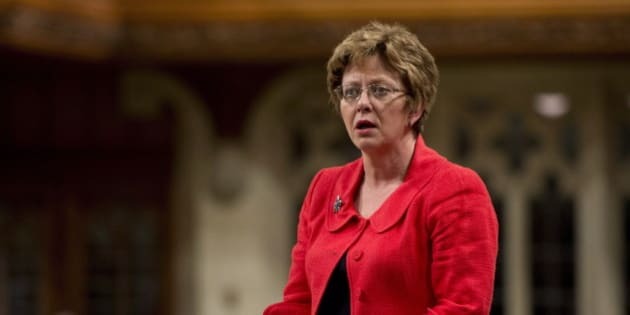 OTTAWA — Longtime MP and former cabinet minister Diane Finley says she has the experience to guide the Conservative caucus into its new role as the official Opposition, and intends to run for the interim leadership of the party. The reduced caucus of 99 MPs is responsible for appointing the interim position, but the date for their next meeting has yet to be set. The party's constitution says that an interim leader cannot seek the permanent position. In an interview, the 58-year-old Finley, a former businesswoman, said she has the right resume for the interim leader's role, starting with the fact that she sat with the party in opposition after her first win in 2004. She said the role will require a good manager, as the caucus transitions into a different kind of operating culture. "When you're in government, you have the officials and bureaucrats to do a lot of research for you, to prepare speeches and notes. You have a much bigger political staff to be able to support the members," said Finley, whose last cabinet post was as public works minister. "When you're in opposition, you don't have that, you have to do a lot of the work yourself...so you have to become much more self-sufficient, and a lot of our returning members have never sat in opposition, so that's something for which they're going to need some support in developing those skills and talents." Finley said she does not know yet when the caucus will convene and vote for interim leader. Prime minister-designate Justin Trudeau is naming his cabinet on Nov. 4, and the Conservatives will need to shape their own shadow cabinet. She's already got some criticism for Trudeau, who attended a memorial service Thursday marking the anniversary of last year's Oct. 22 shooting on Parliament Hill. Trudeau has already made U.S. President Barack Obama aware that he wants to end Canada's role in the bombing mission in Syria and Iraq. On Thursday, media reports suggested the Liberals are already looking at proposed changes to Bill C-51, the controversial anti-terror legislation passed last year. "Mr. Trudeau is out there reinforcing that he will withdraw our troops from the Middle East and that he'll repeal parts of Bill C-51, that were intended to help our intelligence agencies protect Canadians," said Finley. "The number one job of any government is protect Canadians, and for him to announce those things today was I thought rather inappropriate." The position of leader of the official Opposition comes with a number of perks, including a car and driver, use of the official residence at Stornoway, and a salary bump of $80,100. Other names circulating for interim leadership include former ministers Rob Nicholson and Denis Lebel. Finley would follow in the footsteps of Deborah Grey, who was interim Canadian Alliance leader in 2000 and the first woman in Canadian history to serve as leader of the official Opposition. In March, Commons ethics watchdog Mary Dawson found that Finley had broken conflict of interest rules when she ignored the advice of bureaucrats to award $1 million in funding to a Jewish Community Centre that was being pushed by Conservative politicians and insiders. Finley said wants to help put the party on a solid footing before the permanent leader is selected. "We want to protect our brand name, which is very good. We've got a lot of good policies and values, and a lot of Canadians respect those," Finley said. That viewpoint seems to gel with the findings of consulting firm Ensight Canada. It talked to voters in cities across Canada right after election day, using focus groups, online forums and other research techniques to determine why voters made their choices. The researchers found that the Conservative loss was not really about the party or its policies. "There's lots of respect left," said Jaime Watt, a principal at Ensight. Rather, the vote was a rejection of Stephen Harper as a mean-spirited, unapproachable and needlessly divisive leader, Watt explained. "This was not a repudiation of the Conservative party," said Anne Kilpatrick, another Ensight principal. "We heard this election was fundamentally a referendum on Stephen Harper."